Google’s Search Plus Your World is the most recent and arguably most significant change the search engine behemoth has made to search yet. In the old days (old = a couple of weeks ago) search results could be based on say, keyword relevancy, page authority, and social signals. With Search Plus, the nature of search, relevancy and ranking is transforming. Search Plus essentially aggregates data from your Google+ network (when you’re signed in) and delivers personalized results (from your Google+ network), which get bumped up to the top of your search engine result page (SERP). So if you search for SEO, you’ll get suggested People and Pages on Google+ that are relevant to your search term. Regardless of whether there is more relevant or pertinent information about SEO, Search Plus gives preferential treatment to Google+ activity. Essentially, Search Plus has been forced on to users, and is singlehandedly knocking down the rankings of quality sites. This has made Twitter mad. It has made lots of people mad. In fact, it drove Twitter, Facebook and MySpace to team up to create a Don’t Be Evil browser add-on, which counteracts this latest Google update. But let’s get beyond the anger and instead get practical. How can you play nice with the new update and your existing sharing platforms. Search Plus has magnified the importance of blending your web marketing strategy so that it will adhere to the at once social, personal, and personalized search algorithm. Search Plus Your World doesn’t mean Social Minus Your Other Networks! Use your extended branding channels for specific purposes. Here’s a drill down on how to harmonize Google+ with your current platforms. Before throwing all your eggs into the Google+ basket, make sure you’ve perfected your main website’s usability. Think of website optimization as the lungs of your web marketing strategy. Your optimized pages act as the oxygen being delivered to the heart (search engines) so that that it can travel through the rest of the body (the SERP). This means having the following. Make your website robot and human-friendly. The more personalized the web becomes, the more important it is to create metadata for the user. Properly optimized title tags should contain the search terms you’re targeting. Titles are the first to communicate with both spiders and readers, so clean, concise title tags can get your site reviewed faster by search engines and by people. While meta descriptions don’t significantly influence search engine rankings, they are extremely important in gaining user click-throughs from SERPs. Meta descriptions are a way of telling searchers what your content is about and how it’s relevant to their search. Images are one of the most shared pieces of content on the web, but especially in the social sphere. Since Googlebots can’t see images directly, we need to provide them readable information in the “alt” attribute. Alt tags should be brief, clear, and descriptive of the image. Doing this simple (but often neglected) step will help make your images more accessible to other platforms. Image descriptions also add rich snippets of data that enhance the user’s experience and understanding of the visual. Adding alt attributes and descriptions can help boost your rankings in image search if you choose to include a keyword you’re targeting (but only do it if it’s relevant). On top of linking specific web pages to their valuable counterparts (product pages, about page, contact form), you need clear links to your social platforms on your home page. This will help keep your brand name SERP filled with listings of your social platform pages and clear from less predictable brand related content on other sites. The most important pages (from a user perspective) on your website (like the home page and product pages) should include the top share buttons (Facebook, Twitter, Google+, LinkedIn, etc.) in easy-to-find locations on the page. Generally, the top or bottom of the content is good starting point for position optimization. Before the Search Plus Armageddon, Google’s Freshness update was the big change to search. With this update, Google returns the latest, relevant web content for certain queries. We were speculating that it would make real-time sites like Twitter a main contender for top rankings in the SERP. No dice with Search Plus. The main takeaway is that you should be modifying your website’s content (e.g., adding new products to products pages, modifying descriptions) but mainly, you should be using your brand’s social profiles as key channels for publishing fresh, updated content. Key takeaway: Optimize for humans. Once you have a fully optimized, human-robo-friendly website, it’s time to start investigating what others in your niche are doing on their social platforms. What’s working for your competitors on their social networking pages? How many people are in their Circles? How much engagement are they actually inciting across these platforms? Look at what your competition is talking about, sharing, and promoting and run an exhaustive analysis of their social channels to determine what kind of content is getting the most positive feedback, and what does poorly. You can do a quick assessment of their content using tools like Open Site Explorer or bit.ly to track the number of shares, votes, and Likes the content got. See if you can find a connection between the top content and the platform it was submitted to. Maybe you’ll find that Facebook has more video and images being shared while Google Plus users may prefer news and articles. Once you know what your competition is doing right, determine what they could be doing better. Fill that gap. As an example, one surprising search result you can find is for Coca-Cola’s Google+ page. Not only do you have to type that exact phrase to find it, but Pepsi’s Google+ page actually outranked Coke’s for a branded search term! Seriously, look at what your competition is doing. What kind of engagement are you getting across platforms? Who is your audience on Twitter? Are they different from your Facebook audience? What type of content is working with your Twitter followers? What gets shared the most from you on Facebook? Again, find out which avenues are better for specific types of content. Use social tracking tools like Radian6, Sysmos, or even less purpose-built tools like OpenSite Explorer, bit.ly and Blekko to help you pull a thorough analysis of both your best and lowest performing content. Now, start thinking about how you can harmonize your content/sharing strategy. Key takeaway: Master what you’ve got. Once you’ve determined where you (and your competitors) stand within your specific platforms, consider creating unique strategies for each. Each social platform can provide rich channels for engaging with your different audience segments in unique ways. Harmonize the accounts by defining specific roles for each. All these extended channels allow you to show your business’ many faces. For instance, Facebook could be your go-to venue for promotions and contests. Twitter may be where you offer quick tips, answer questions, comment on industry-related news. Your own YouTube channel could be a space where you post instructional videos or entertainment (be aware that corporate videos will very rarely see the same kind virality as user-generated ones, unless your campaign is really unique and engaging). Google+ can (should) be a tool for improving your rankings (you can actually apply your SEO tactics to Google Plus!). It’s still early to draw any conclusions about how deeply Search Plus will influence your sharing strategy in the long run, but you need a strong presence. That means lots of people in your Circles, and an SEO-friendly profile that is fresh and updated. These will directly impact your rankings, so act now and define your G+ presence. 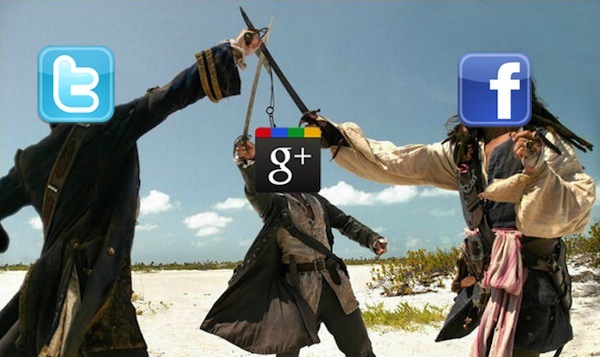 The adoption of Google+ is growing fast, 90 million users strong, 60 percent of them active. If you snooze on this one, you’re missing out on some really easy ranking opportunities. An important lesson that we can take away from events like Search Plus is that we should always leave room for interpretation and change in our online marketing strategies. Keep tabs on what industry leaders and competitors are doing. Draw from their strengths, and modify them to implement them into your own practices. Making sound business decisions comes from learning what’s going right and wrong on the other side. You have to try things out, take risks, and establish a presence in the many existing facets of social media. This will help you understand what the advantages and drawbacks are in each platform. By keeping abreast of the web climate, you will learn to develop a sixth sense about when things might be subject to change. This way, you can hear the quiet before the storm. By adopting strong SEO and social strategies, you can diversify the way you raise your brand to search engines and most importantly, to people.